Muscat party people are you ready! 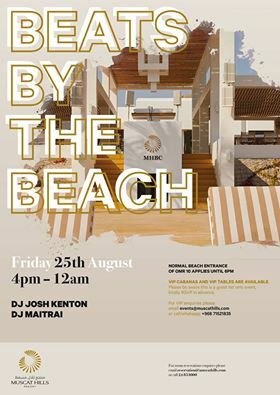 Beats by the Beach is back on Friday 25th August with DJ Josh Kenton flying in from the UK to get the party started at Muscat Hills Resort alongside our resident DJ Maitrai Joshi! Josh has performed in Central London and Oxford including Embargo Republica, Montezuma, the W hotel, O2 Academy Oxford and the famous Bullingdon Club Oxford. This summer Josh has been making dance floors move at hot lounges, beach bars and clubs in Miami, Marbella and St.Tropez! Muscat Nights > Events > Beats by the Beach is back on Friday 25th August….